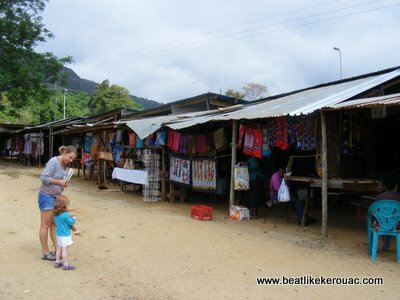 The Swazi Way | Beat Like Kerouac – now with child! After three glorious days of animal watching in Kruger National Park, we were headed out into the mountains, in search of the thatch-roof cottages, proud local culture, and reasonably-priced arts and crafts of the kingdom of Swaziland. With the exception of Kruger, a perfectly organized and well-appointed national park, South Africa in general had stunned us a bit. From the moment we pulled out of Johannesburg airport in our rental car, we were amazed by the differences between Africa and everywhere else we’ve ever been. Houses, regardless of size were surrounded by six-foot fences with locked gates and razor wire. Cows and goats wandered along highways and off-ramps as well as dirt back roads. People were walking everywhere – along interstates, through fields, with babies tied tightly on their backs and luggage balanced perfectly on their heads, and we, white people, were definitely in the minority. It was an odd feeling, and even though most people spoke English, we had never felt so far from home. Swaziland was about to provide us with some unexpected surprises. Leaving the tension of urban South Africa and entering the tiny mountainous oddity of Swaziland, not only the landscape, but the general demeanor seemed to change. Once we were through the funny little customs office, people waved as we passed by instead of glaring at us suspiciously. Little craft stands dotted the roadsides, and smiles were generally more abundant on the faces of the locals. Locals and service workers were friendly and initiated conversations, even asking to take photos of Lily and me (I guess both our hair colors were a bit of a novelty). Although the poverty was by no means gone. Chickens scuttled along through parking lots. “Grocery” stores stock rice, beans, flour, Red Bull and not much else. People were still walking everywhere, constantly trying to thumb rides. The only other vehicles we seemed to pass on the road were overly full mini-buses, utility trucks, and the occasional rental car like ours. How is it possible for a country to be so welcoming and so poverty-stricken at the same time? On our first full day in Swaziland, (after a night of staying in a beautiful thatched-roof hut at our resort) I took a 2 hour horseback ride to get a better feel of this land. My guide, Obed, started off the trip by telling me a few dumb jokes (to get me to relax, I suppose) and then began to talk about this unique country. We were riding through the “middleveld,” an area of land between the rocky “highveld” of the mountain tops and the dusty brown “lowveld” of Kruger National Park. Much of the highveld was contained in the lovely Malolotja Nature Reserve, protecting the mountain flora and fauna, as well as the remains of the 40,000 year-old Ngwenya iron ore mine. (The letter “n” before a consonant is pronounced “uh,” I found out). We had visited the mine area earlier in the day on a personal tour with a friendly, soft-spoken park ranger, who lived in the park and also amazingly, owned no car. He, like Obed and many other Swazi people, saw nothing unusual about walking 3-10 km every day to get to work, and had trouble understanding the dependence of Westerners on cars. 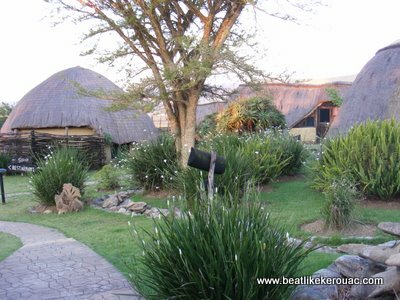 Perhaps it was one of what Obed often referred to as “the Swazi way” of doing things. 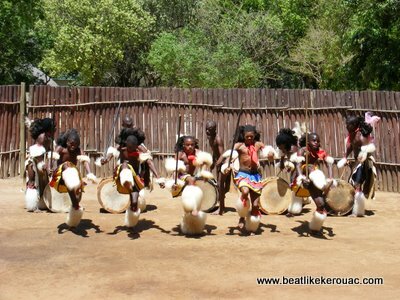 I found that Swazi people have an amazing pride of culture, and are happy to share their history with visitors. They’ve been largely spared the racial struggles of South Africa and many of their other African neighbors due to tribal similarities and a continuing absolute monarchy, which has remained uniquely intact even through a brief period of British occupation in the 19th and early 20th centuries. The monarchy is an interesting subject to bring up to a Swazi local, as I’ve read mixed reviews on the topic and wasn’t sure what type of reaction I’d get. The current king, Mswati III, has been criticized for leading a rather opulent lifestyle while the majority of his people live in terrible poverty. Yet many people seem fine with the monarchy, and even sell T-shirts and blankets with the king’s picture on the front. The monarchy encourages national pride and unity by celebrating several traditional cultural events. The beautiful costumes, songs, and dances of the sibhaca, in which Lily was able to join at the Swazi cultural village in Mantega, allowed us to experience these in the “Swazi way.” Sacred traditional ceremonies are still in practice, like the incwala, where young men travel miles to harvest branches of the lusekwane tree, learned men called bemanti present various items from all parts of the country, and people eat the first crops of the new year. Another famous ceremony is the umhlanga, or reed dance, where maidens pay a tribute to the queen mother. This is also a time where the king may choose another wife from the array of scantily clad virgins dancing in front of him. Mswati III currently has nine wives, at least one of which is younger than his oldest children. I’m not sure how I would feel about that, but apparently his kids deal with it, as it is the “Swazi way.” Mswati’s father, the revered King Sobhuza II, had over 70 wives and 200 children. When I asked Obed about the king and his polygamy, he said although most people today still have traditional wedding ceremonies, most no longer practice polygamy or agree with it. But it was the “Swazi way.” “You have to understand,” he told me, “it’s our culture. It is an old way of doing things, but it is the Swazi culture. Also, it is expensive, as a man would have to pay for each new wife in many cows.” And that was all the explanation I was going to get that day. It’s funny what you think of when your mind is allowed to wander in a strange place. I actually thought of the king and his many wives as we rode our horses through a field of cattle. Obed pointed out the bull, a gray Brahma languidly swishing his tail in the middle of the field, surrounded by females and calves of varying colors, breeds, and horn lengths. It also struck me that a herd of cattle in America would never look like this. They are almost always monochromatic and breed specific, with a herd bull almost nonexistent, as most cattle ranchers now favor safer and more economical artificial insemination techniques. Obed pulled me out of my daydream by telling me to round up the calves. “I don’t know” was the response. I realized now that we were on someone else’s unfenced land. Long having left the resort property, our trek had taken us across the road and through a patchwork of homesteads, rocky outcrops, pastures and fields. “Well who owns the land?” was my next question. Although his English was perfect, Obed looked at me as if he didn’t understand what I’d asked. I got the impression that no one owned the land, or perhaps the king did. Or perhaps the owner gave permission for several people to build “homesteads” on his land and walk to and from the road, and ride horses and keep cattle, without any kind of regulation. I thought about the King and his extravagance once more as we continued to ride down a dirt track past a collection of cabin-like houses made from a mix of concrete blocks, corrugated iron, and reed thatch. A woman was hanging rows of brightly-colored washing on a line in her backyard and I realized her house had no electricity or running water. A glance to the left proved that it was washday for the neighborhood, as I noticed several women and children literally washing clothes on rocks in a nearby stream. It was truly amazing, this place. If you forget you are in Africa for one second, you are immediately reminded otherwise. When we returned to the resort later that afternoon, we noticed three little kids hanging around the dirt road by the fence. They probably ranged in age from 8 to around 4 or 5, and looked exactly like I expected poor rural African children to look – barefoot, with dirty threadbare clothes, and wide-eyed, frightened expressions. There was no adult in sight and we wanted to do something nice for them, and maybe even get them to talk to us. We eventually decided to bribe each with one of Lily’s lollipops. Lily was happy to share, and although the kids shyly took the lollipops and answered when we asked their names, they scurried off too quickly for us to find out anything else about them. Lily, in complete innocence, was confused as to why they couldn’t come with her to jump on the resort’s trampoline. A thought that this life I was looking at with such alien eyes was probably not unlike life in rural America at the turn of the century, or during the Great Depression, or even in backwoods Appalachia twenty years ago. Although there are poverty-stricken areas in all countries, in Africa they seem to be the overwhelming majority, with the tiny population of wealthy living in a range of lifestyles, from what we would consider middle-class to the opulence of the royal family. Regardless of their hardships, most Swazis we met seemed to go about their day with an amazing amount of cheer. Their friendliness was more reserved, almost polite, when compared to the embracing love of the Greeks, but we definitely felt welcome and appreciated wherever we went. If that is the “Swazi way,” I could probably get used to that. Gallery | This entry was posted in Culture, Philosophical, South Africa, South Africa, Travel and tagged Africa, horseback riding, poverty, South Africa, Swaziland, travel, travel with kids. Bookmark the permalink. really enjoyed your thoughts Ashley. good post.